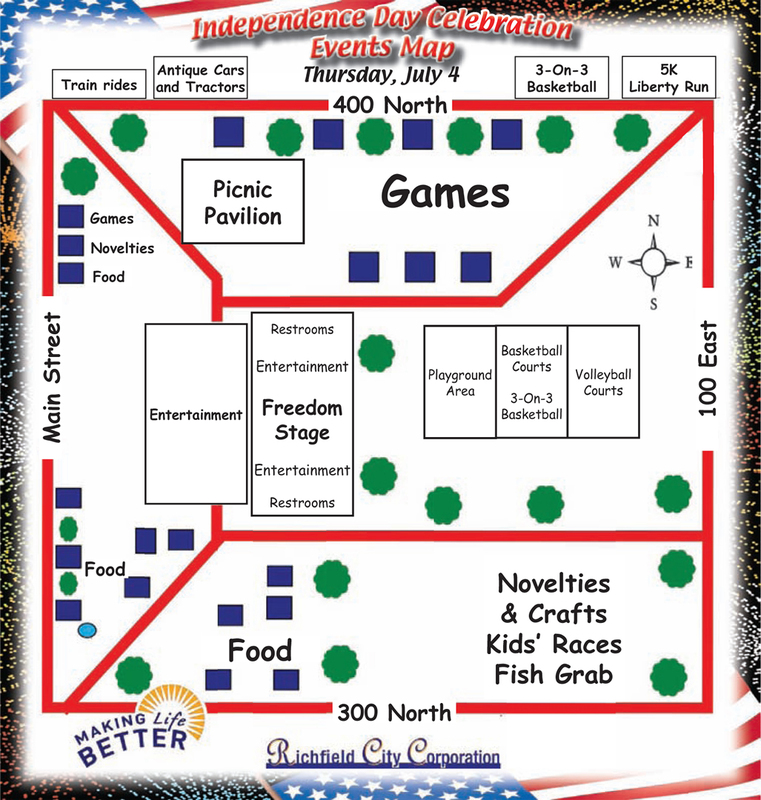 Have a safe and happy Independence Day Weekend! 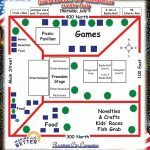 map design by Graphic Designer Dallas Price for Richfield City. Published in The Richfield Reaper 06/25/2014. It was late on a Monday when I got started on it, and I have a tendency to get carried away on things like this. What started as strokes for the sidewalk turned into sidewalks, what started as little green blobs that were trees turned into trees, and the icons for the booths turned into tents. One of the more interesting parts of this map was including the fish grab. For those of you that aren’t from a little redneck town in the middle of nowhere, a fish grab is where all of us hillbillies gather around and have our offspring fight to grab trout out of a pool. This was a huge controversy this year as it was almost cancelled. Between animal rights people, volunteers and sponsors, someone somewhere thought we didn’t need it. I couldn’t find the original controversy but, David Andersons article is pretty good read. On a blistering, hot day, there’s nothing quite as refreshing as being smacked in the face with a warm trout. So naturally I wanted to toy with ideas while incorporating the fish grab but, for some reason they wouldn’t let me get away with the dead fish laying there on the grass. Quick rendition of the dead fish I was going to use for the fish grab. While doing this map I paid special attention to the colors and seperations, making sure that the only things that seperated were things that had to (grass and trees). The only thing I don’t like about this design is the header, it’s just too much … hard to read. 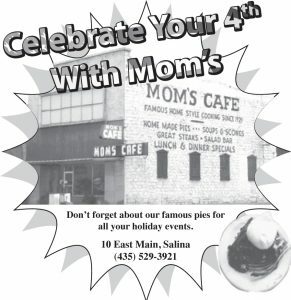 Advertisement design by Graphic Designer Dallas Price for Mom’s Cafe. 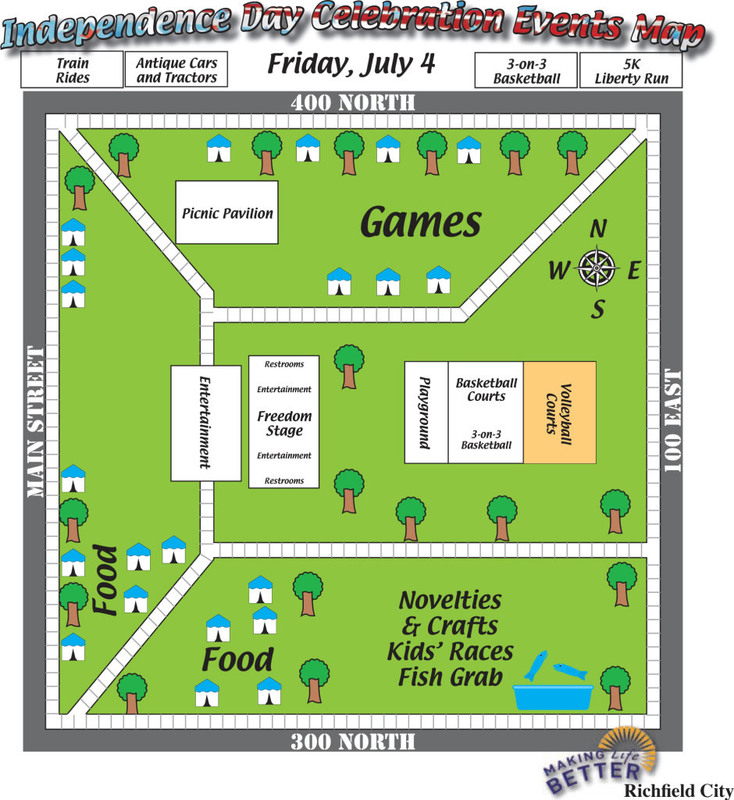 Published in The Richfield Reaper 06/25/2014. On the subject of design, WOW. If you missed this ad you’re probably blind, it’s enough to give common people a seizure. With that said, the original one that I sent was pretty boring, she wanted it “more festive” So naturally I had to do something a bit over the top. Sometimes it’s really difficult designing in black and white. The photo of a pie (we’ve used multiple times) is really difficult to see or tell what it is, I think to be more effective it could be a pie with a slice cut out or something. I mean, you can’t even tell what that blob of crap is. Both the salesperson and client were happy with this though and I suppose I can’t complain much. 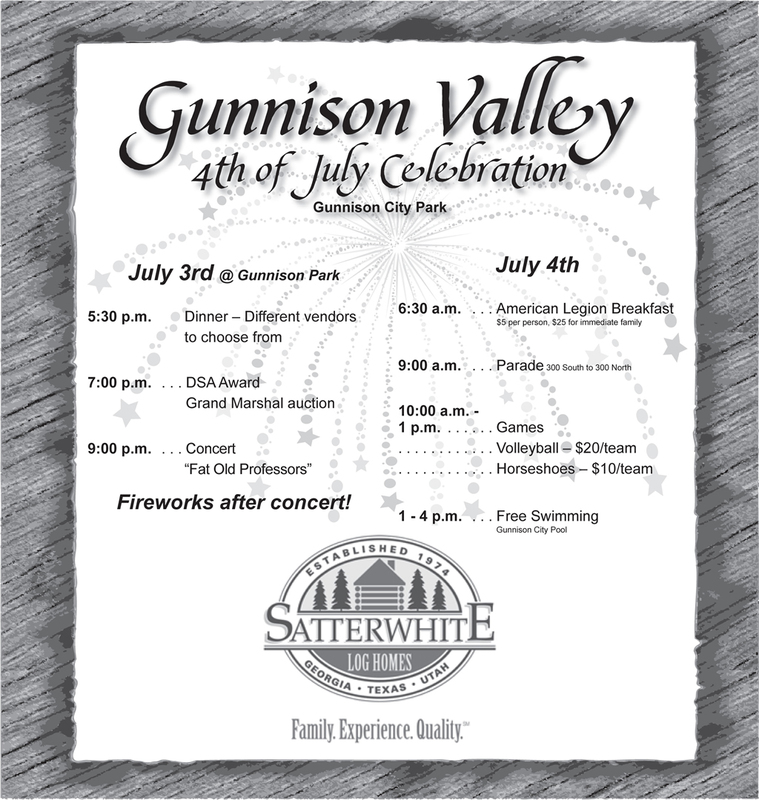 Advertisement design by Graphic Designer Dallas Price for Gunnison Valley’s 4th of July celebration, sponsored by Satterwhite Log Homes. 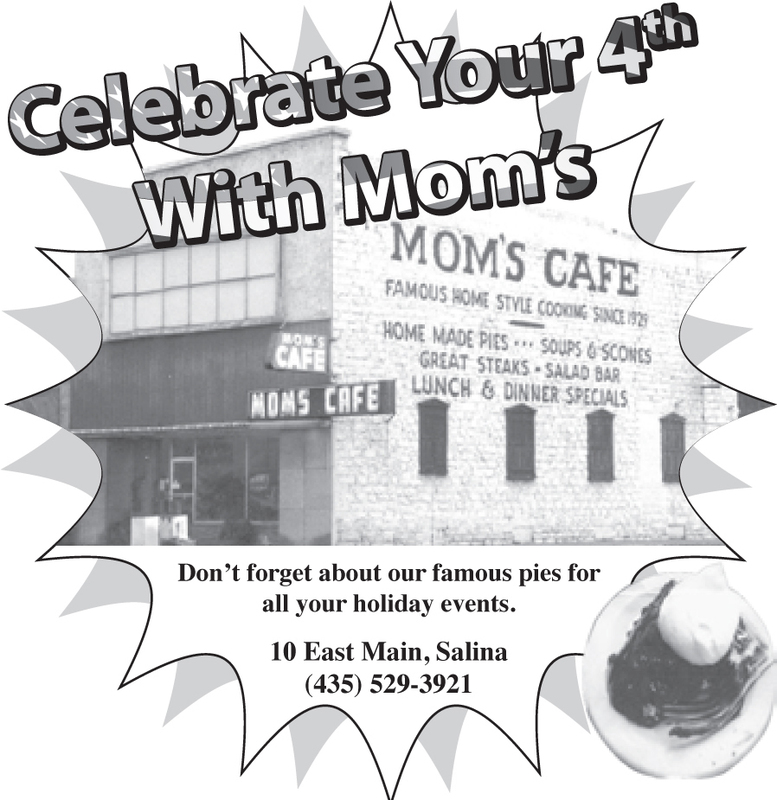 Published in The Richfield Reaper 06/25/2014. I don’t really have much to say about this one, I like smaller logos and the leading could have been increased between events. 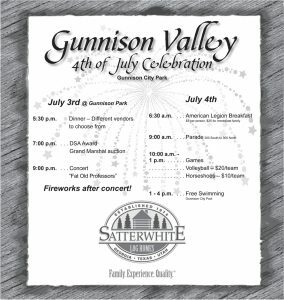 Satterwhite wanted their logo bigger and in the center though, and who can blame them when sponsoring the schedule of events. This post is part of a series of posts dedicated to getting my graphic design portfolio out of my desk and into the world. Want to start from the beginning? Previous PostPrevious You need a graphic designer.